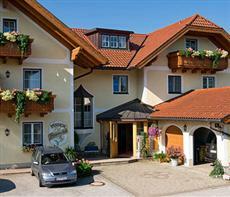 The Hotel Frauenschuh is located in Salzburg making it one of the best hotels to stay at while in town. All hotel's guestrooms have all the conveniences expected in a hotel in its class to suit guests' utmost comforts. All of the guestrooms are replete with non smoking rooms, bathrobes, daily newspaper, inhouse movies, desk, hair dryer, ironing board, television. To suit guests' convenience, this Salzburg accommodation offers laundry service/dry cleaning, hotel/airport transfer, babysitting, business center, bicycle rental, pets allowed. Leisure and sports facilities available on the hotel's property comprise massage, jacuzzi, gym, sauna, garden. With elegant facilities and hospitality, guests at this hotel will surely have an impressive stay. To book a room easily at the Hotel Frauenschuh, please submit your travel dates and proceed with our secure online booking form.